Picture Perfect Art Gallery and Cake is located at the west end of Dundas, on the north side of King Street West, next door to the Dundas Lofts (previously Dundas District Public School) and just before King Street turns to the left and goes up the escarpment. Look for the sign in front of the house with the black wrought iron fence. For full driving instructions scroll down for Google Maps. 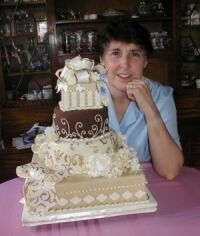 JUNE LYNCH, OWNER AND DESIGNER, PICTURE PERFECT CAKE.